If you're looking for a powerful truck to handle all the needs of work and play then look no further; the 2016 Nissan Titan is just for you. This powerful truck will handle any situation thrown its way without breaking a sweat! The 2016 Nissan Titan has amazing space for all your precious cargo so you'll never feel like you left home. At Headquarter Nissan of Columbus, you'll have the opportunity to purchase the 2016 Nissan Titan for an amazing price. Headquarter Nissan of Columbus is located at 1725 Whittlesey RD. in Columbus, GA and serves the following cities: Ft. Benning, Cataula, Lagrange, GA and Phenix City, Auburn, AL. 2016 Nissan Titan has a starting MSRP of $29,640. The MPG rating on the Titan is 13 city / 18 hwy. The 2016 Nissan Titan has a wide selection of features and amenities you'll love. There are three models to select: King Cab S, King Cab SV, and King Cab Pro-4X. Exterior colors include arctic blue metallic, brilliant silver, cayenne red, glacier white, gun metallic, midnight jade, pearl white, Saharan sun, and super black. The interior color has an almond cloth or a charcoal cloth. 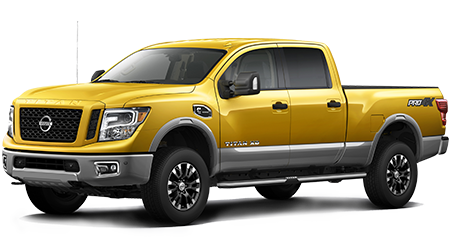 The 2016 Nissan Titan comes equipped with a 317HP 5.6L V8 engine. Features include 18" painted steel wheels, oil pan skid plate, fuel tank skid plate, body-color front bumper and silver rear bumper, black grille, black door handles, black outside mirrors, dual manual outside mirrors, optional class 4 tow hitch receiver, 7-pin wiring harness and trailer brake controller, rear tailgate spoiler, locking tailgate, cargo bed light, and Four fixed cargo bed tie-downs. The trim on the 2016 Nissan Titan Includes 40/20/40 split bench, 60/40 split fold-up rear bench seat, S cloth seat trim, and a column shifter with manual shift mode. When you purchase a premium 2016 Nissan Titan, you're purchasing more power, luxury, and efficiency. Standard features include 18" unique dark-finished aluminum-alloy wheels, transfer case skid plate, lower radiator skid plate, front tow hooks, automatic on/off headlights, fog lights, tow hooks, body-color bumpers, satin chrome-finished grille, dual power outside mirrors, optional power heated extendable tow mirrors, body side moldings, black wheel arch moldings, splash guards, class 4 tow hitch, sliding rear window, rear privacy glass, rear sonar system, lockable bedside storage, locking tailgate with dampened assist, cargo bed light, and Four fixed cargo bed tie-downs. Interior features of the premium models include optional 5.8"touch-screen display with navigation, Nissan Connect with mobile apps, rearview monitor, hands- free text messaging assistant, Bluetooth, air conditioning, power door locks/ power windows, remote keyless entry with remote front windows down, optional HomeLink universal transceiver, tilt steering column, variable intermittent windshield wipers, door courtesy lights, footwell lights, multi-functional driver's information center with outside temperature display, sun visors with illuminated vanity mirrors and extension,, two dash-mounted 12-volt DC power outlets, center console-mounted 120-volt AC power outlet, digital clock, retained accessory power, battery saver, voltage and oil pressure gauges, transmission temperature gauge, and grocery hooks. Standard safety features in the 2016 Nissan Titan include Nissan advanced air bag system with dual-stage supplemental airbags, driver and front passenger front/side airbags, roof-mounted curtain side-impact supplemental airbags, vehicle dynamic control with traction control system, blind spot warning, rear cross traffic alert, optional predictive forward collision warning, optional forward emergency braking, 3-point ALR/ELR seat belt system, front seat belts with pretensions and load limiters, lower anchors and tethers for children, zone body construction with front/rear crumple zones, hood buckling creases and safety stops, Pipe-style steel side-door guard beams energy-absorbing steering column, and a tire pressure monitoring system with easy-fill tire alert. You can count on Nissan for having amazing safety measures on their cars! When it comes to an amazing truck that can do it all, you'll love everything about the 2016 Nissan Titan. If you're looking for a dealership that has one of the best customer services and deals in town, then you'll love Headquarter Nissan of Columbus. Come to Headquarter Nissan of Columbus for an incredible selection of cars and an enjoyable experience! Headquarter Nissan of Columbus is located at 1725 Whittlesey RD. in Columbus, GA and serves the following cities: Ft. Benning, Cataula, Lagrange, GA and Phenix City, Auburn, AL.